Today’s Throwback Thursday looks at one of my personal favorite gachapon series, Yujin’s Wind Waker and Four Swords, Legend of Zelda figure series. Based on the popular 2002 games Legend of Zelda: Wind Waker for GameCube and The Four Swords for the Game Boy Advance, these figures reflect the Toon Link or Celda variation of Zelda characters that have appeared in numerous Nintendo games since 2002. 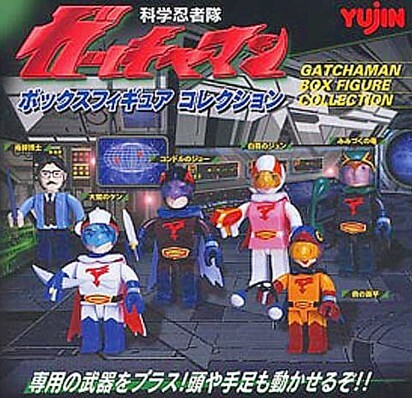 Released in a two-part series in August and November of 2003, a total of 17 figures were available to purchase from gachapon machines for ‎¥200 each. What makes these figures so special, and so collectible among gacha and Zelda fans, is their articulation, extensive accessories and play features– something that’s not commonly found among gachapon at this price point. Measuring just under two inches, the head, arms, legs and hands are movable, and the figures can hold their own accessories. The high level of detail and play value, makes Yujin and their design teams efforts to capture these iconic Zelda characters and game items, particularly commendable. These figures also contain a really neat feature: when the your turn the head of each figure, their eyes move back and forth. Zelda fans will recognize this as a reference to a Wind Waker game feature; where in certain tricky puzzles, Link would give players a helpful clue by looking in the direction of the next required task. This moving eye, or “Kyocho eye system” (キョロ目システム) was developed by renowned toy designer and creator of Mechatro Wego Robot, Kazushi Kobayashi. According to Kazushi, the lead designer of the Zelda Box Figure design team was inspired by Toon Link’s expressive eyes, after watching gameplay of the Wind Waker. Kazushi initially designed the figure’s eyes to move with a lever, but did not want to hurt the appearance of the figure. Kazushi ultimately designed an internal mechanism that would move the eyes with a simple turn of the figure’s head. You can see from the picture below how the mechanism functions. Pretty clever eh?! The design feature was so well received that Yujin continued to implement it in its Disney Kyo Roko collection. Some may also notice the minifigure look used in these figure designs. The hands are rounded like a LEGO minifigure, and the body shape is also blocky. The reasoning behind this aesthetic choice could be attributed to the massive popularity of Medicom’s Kubrick and Bearbricks, and Toy2R’s Qee series of collectible figures at that time, which took its own design inspiration from LEGO minifigs. These Zelda figures are part 1+2 of the fourth part of Yujin’s (Now T-Arts) “Nintendo Box Figure Collection” series (任天堂ボックスフィギュアコレクション), which included minifigure versions of Mario Party (part 1), Super Mario Sunshine (part 2), Mario vs Donkey Kong (part 5). Yujin also released a Pokemon set (part 3 perhaps? ), numerous Disney sets, and Gotchaman set in the Boxed Figure series. Fourteen years later, the Yujin Wind Waker and Four Swords minifigure series, are as collectible as ever. They also sell for a good bit more than the other Nintendo Box Figure collection. Complete sets in their polybags, with included mini books, can fetch as much as $250 in online auctions, and up to $50 for individual figures. That being said, a complete set can be collected at a more modest price if one is willing to search around, or cobble figures and items together. Despite their popularity, Yujin decided to cap the series with these two sets. It’s a shame really, it would have been great to have to other characters and monsters in this format. Beedle, Tingle, a Goblin and a Gannon, would have been dope! Series one which is based on the Wind Waker series contains five figures, including three varieties of Link with numerous facial expressions (happy, normal and angry), his sister Aryll, and Tetra (Zelda). Each comes with their own unique items. – Normal Link comes complete with sword, shield and a Tingle Tuner. – Angry Link comes complete with sword, shield and a blue and red rupee. – Happy Link comes complete with sword, shield and a bomb. – Tetra comes complete with a yellow and green rupee. – Aryll comes complete with a telescope and heart piece. Series two which is based on the Four Swords series contains twelve figures, utilizes the same “happy, angry and normal” Link mold from the original series, and updates the figures with a green, red, blue and purple coloring to reflect the styling of the multiplayer colorways. Although the mini book shows only four figures; each figure came with three facial varieties. – Green Link comes complete with the Four Sword, shield and a Stray Fairy. – Red Link comes complete with the Four Sword, shield with a bomb. – Blue Link comes complete with the Four Sword, shield and a bow. – Purple Link comes complete with the Four Sword, shield and red and blue rupee. Just in time for the launch of the Super Nintendo Mini and Super Famicom Mini, Takara Tomy/ T-Arts is re-releasing their 2011, ￥300, Nintendo Super Famicom History Collection. Due out in December, T-Arts will once again be distributing these super tiny SFC capsule toys in gachapon machines throughout Japan. Just like the original release, there will be a total of six SFC sets to collect, complete with removable cords, controllers and cartridges. Whether you are a Nintendo fan or looking to add some 1/12 figure scale accessories for your Figma collection, this set is a must have. For more information on these mini consoles, check out the gacha guide to Console History Collection.